Trojan asteroids are trapped in stable gravity wells, called Lagrange points, which precede or follow a planet. OSIRIS-REx is currently traveling through Earth's fourth Lagrange point, which is located 60 degrees ahead in Earth's orbit around the sun, about 90 million miles (150 million kilometers) from our planet. The mission team will use this opportunity to take multiple images of the area with the spacecraft's MapCam camera in the hope of identifying Earth-Trojan asteroids in the region. 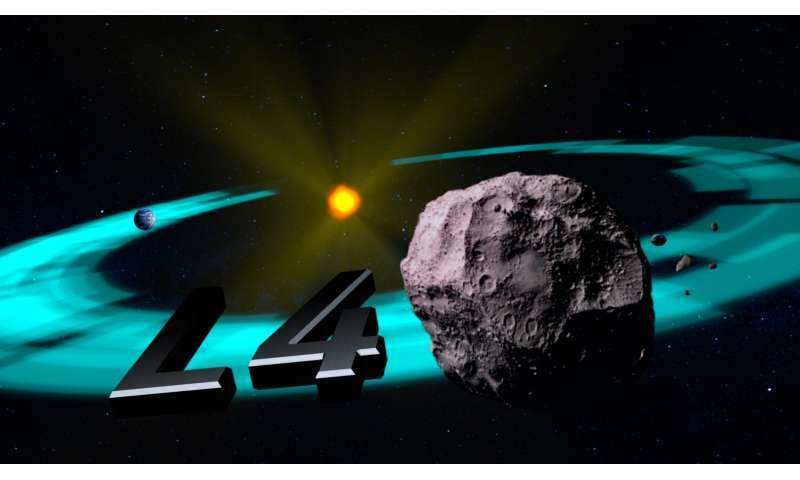 Although scientists have discovered thousands of Trojan asteroids accompanying other planets, only one Earth-Trojan has been identified to date, asteroid 2010 TK7. Scientists predict that there should be more Trojans sharing Earth's orbit, but they are difficult to detect from Earth as they appear near the sun on the Earth's horizon. "Because the Earth's fourth Lagrange point is relatively stable, it is possible that remnants of the material that built Earth are trapped within it," said Dante Lauretta. "So this search gives us a unique opportunity to explore the primordial building blocks of Earth." The search commences today and continues through Feb. 20. On each observation day, the spacecraft's MapCam camera will take 135 survey images that will be processed and examined by the mission's imaging scientists at the University of Arizona, Tucson. The study plan also includes opportunities for MapCam to image Jupiter, several galaxies, and the main belt asteroids 55 Pandora, 47 Aglaja and 12 Victoria.